There are a lot of ways to keep people warm on a cold day. As a business owner or building manager, you can ensure your employees and visitors have a place to hang their coats, hats, and umbrellas when they arrive; you do what you can to make the people who come into your environment comfortable. There are other steps you can take to keep your customers cozy and add a touch of class and comfort to your business. By placing a drink dispenser in your office, you can offer hot beverage options to all of your visitors and customers. Why take this extra step? What are the benefits? Most importantly, what beverage options do you have? Improve Morale & Mood: Regardless of the products or services that bring individuals into your business, they can all grow tired of waiting for service. A beverage dispenser can ease nerves, boost morale, and create a comfortable environment. And if waiting is an inevitable part of your business, customers will have more patience as they wait. No Skills Required: Placing a single cup brewer coffee machine, hot tea maker, self-serve coffee bar, or other beverage dispenser in your business requires no special skills, expertise, and very little extra time out of your day to maintain and care for the equipment. Plus, when you partner with a supplier like Bernick's, we take care of restocking, cleaning, and providing supplies - without you needing to ask us to. Upscale Ambiance: Most importantly, a hot beverage dispenser can enhance the image of your business in the eyes of your consumers and your employees. When they walk into an office or waiting room with a variety of options available to them, their image of your brand is improved and they may even recommend your business to others. Coffee: Caffeine can make people feel more alert, boost mental and physical performance, and elevate their mood. Regular and decaf coffees are rich in polyphenols, which are antioxidants that regulate blood sugar in the body and prevent blood clots. Tea: Various types of tea are rich in antioxidants that can protect against cancer, heart disease, osteoporosis, and even memory decline. It has even been found to help people maintain a healthy body weight. Herbal infusions: Herbal teas are caffeine-free infusions of flowers, roots, barks, and berries in a hot beverage that can ease coughs, sore throats, and even enhance anti-inflammatory properties in the body. Hot cocoa: Cocoa has flavanols (a type of antioxidant) that helps lower blood pressure, reduce stroke risks, and protect against diabetes. Two cups a day of hot cocoa can even help improve cognitive functions. Whatever reason you have for wanting to offer hot beverages to your employees and visitors, you have a lot of options. In addition to standard hot beverages like coffee, tea, and hot cocoa, there are a few options that are less common, but gaining popularity. The next time you purchase hot beverages for your office dispenser, consider adding hazelnut white hot chocolate, spiced teas, mint tea, or hot apple cider. 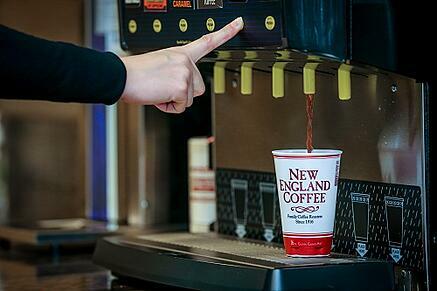 There are a lot of exciting hot beverage options available to keep your dispenser stocked and your customers happy. Lucky for you, we make it our job to stay up-to-date on trends and get you everything you (and your people) want - and more.